Upcoming Game Changer: Turkish-Kurdish Alliance? Recently held regional Kurdish conference in Turkish capital Ankara may have surprised many in the Middle East and beyond but few realized that the event was a culmination of methodically crafted maneuvering of Turkish government of Prime Minister Recep Tayyip Erdogan. The smart move is aiming at forging an alliance with the Kurds of the region, divided in Turkey, Iraq, Iran, and Syria respectively. Kurdish leaders and intellectuals of all the four aforementioned regions have attended the two day long conferences on Nov. 9-10, and discussed the Kurdish solution process in Turkey and developments outside of Turkey. Participants appreciated the opening up of Kurdish issue that was being now discussed openly in Ankara, something which might not have been possible a decade back. Turkey’s chronic Kurdish problem was embedded with the formation of the Turkish Republic in 1923, by Mustafa Kemal Ataturk. Since the formation of the Republic, the new state adopted extreme nationalistic policies where Turks were considered the only natural inhabitants within the new boundaries of the Republic. Kurds were denied basic human rights, not allowed to speak their language and could not name their newborn babies with Kurdish names. The nomenclature of their towns and villages were changed with new Turkish names. Excessive repression alienated the large section of Kurdish populace, especially in the eastern and southeastern region of the country where Kurdish population is mostly concentrated. As a final resort, Kurds rose against government policies, following which they were brutally repressed by the authorities. Extreme Turkish Nationalism sowed the seeds of Kurdish Nationalism in the form of its militant wing Kurdistan Workers’ Party (PKK). Kurds started waging a guerilla war in 1984 against the Turkish State that resulted in a huge death toll of approximately 40,000 people, most of whom were Kurds. Many Kurds were displaced from their villages. The economic cost of the civil war spanning almost 29 years between the government and the PKK is humongous and approximated at around $400 billion. Divided between Turkey, Iraq, Iran, and Syria the population of approximately 30 million Kurds is the fourth largest ethnic group in the Middle East following Arabs, Turks, and Persians, respectively. Most of the Turks follow Sunni Islam while a significant Shiite Kurdish population lives in the Iranian Kurdistan provinces of Kermanshah and Ilam. The members of the small Fayli Kurdish tribe in Iraqi Kurdistan region are also adherents of Shiite Islam. Finally, in Turkey lives a minority Kurdish population of Alewi belief, an off-shoot of Shiite Islam. Lately armed wings of Kurdish separatists of Turkey, Iraq, Iran, and Syria have started building internal linkages to coordinate and strategize in unison. In a murky asymmetric system of warfare, all the four countries from time to time used their Kurdish fighters against each other while on some occasions they shared intelligence to eliminate them too. Since the arrival of Prime Minister Recep Tayyip Erdogan led Justice and Development Party (AKP) government in to power in 2002, Turkey has started exploring non-military solution of the chronic Kurdish issue. Though the Turgut Ozal government in 1992 initiated the Kurdish opening, it could not materialize the move due to extreme pressure from Nationalists, Kemalists, and the Military. Even previous secret efforts of National Intelligence Organization (MIT)–PKK dialogue in Norway were sabotaged by internal/external enemies of the negotiations, the audio leak of dialogue put Turkish government in to pressure and Prime Minister Erdogan was compelled to come out openly to back MIT and its chief, Hakan Fidan, in an effort to save them from political maligning. Turkish-Kurdish regional alliance may shift the entire topography of the tumultuous Middle East where permutations and combinations are still not put in to place. But this time the dialogue process is followed by months of talks between the Jailed PKK Chief Abdullah Ocalan and Turkey’s intelligence Chief Hakan Fidan and looks more open, comprehensive, and mature to reach the final solution. It seems that both the government and PKK are serious to pursuit a political solution to Turkey’s decades-old Kurdish problem. They would together form “a new force to reckon with in the Middle East.” At the same time, Ocalan made clear that he had no intention to alter Turkey’s territorial integrity. In his speech, Ocalan mentioned many points: Prophet Muhammed, democracy, economy, Arab Spring, Turks, Kurds, Arabs, and Turkmens. Ocalan’s embrace to Turkish-Kurdish unity emanating from common belief in Islam was actually the echoing of undeclared official line of PM Erdogan. Since the beginning of peace process, Prime Minister Erdogan categorically emphasized that his government, in any situation, will not backpedal from the ongoing peace process until the accomplishment of final solution and that he would be willing “to imbibe hemlock” if it is needed. Coming back to the conference where Kurds and Kurdish experts discussed the regional dynamics of Kurds and their future course of action amidst civil wars in Iraq and Syria and the ongoing peace process in Turkey. Most of the observers, during the conference appreciated the dialogue process and welcomed Prime Minister Erdogan’s Sep. 30, 2013 democratization package which although they deemed incomplete, yet hailed as a good beginning. As Erdogan emphasized on numerous occasions, this democratization package is neither the first, nor the last and that many more packages have yet to come. In chain of flouting the “Kurdish taboo,” PM Erdogan joined Iraq’s Kurdish regional government (KRG) President Masood Barzani at a gathering on Nov. 16, 2013 in southeastern Turkish city of Diyarbakir, considered the regional capital of Kurds. Turkish-Kurdish regional alliance may shift the entire topography of the tumultuous Middle East where permutations and combinations are still not put in to place. Kurdish regions of Iraq and Syria are full of natural oil and gas and Turkey is the biggest importer of the oil and gas in the region. Its import bills are expected to be around $65 billion in 2013. Ankara’s deepening relations with the Kurds in Iraq is a point of contention for the central government in Baghdad, reeling under sectarian and ethnic civil strife. Kurds have already constructed an oil pipeline to Turkey that will bypass Baghdad’s control and signed to build another one to increase the oil output. Recently, Turkey has started mending ties with the central government in Baghdad when its Foreign Minister Davutoglu reciprocated his Iraqi counterpart Hoshyar Zaberi’s Turkey visit, Turkey also suggested the new payment and distribution mechanism between Baghdad and Erbil of the oil it imports from Iraq. In an attempt to further mend the ties, Davutoglu also visited Shiite holy city of Najaf and met Grand Ayatollah Sistani. Growing Turkish-Kurdish alliance is an only consolation for Turkey in the tumultuous Middle East and ties between Turkey and Kurdistan Regional Government (KRG) in Northern Iraq have grown deeper in the last few years. Both sides refer to it as “strategic relations.” Without a doubt, their annual volume of bilateral trade, expected this year to be more than $12 billion, lends the impression of strategic depth, but the springtime weather along the Ankara-Erbil axis remains a bit unsteady. The problems of Kurds in Iran are somehow different from the other three Kurdish regions. In Iran they have two simultaneous problems of religion and ethnic/linguistic discrimination. A majority of Kurds in Iran are Sunni after more than five centuries of Shiite rule, but a significant Kurdish population is now adherent of Shiite belief that even vigorously reject the idea of autonomy, preferring direct rule from Tehran. Iran is most anxious by this Turkish-Kurdish alliance as it fears that the withdrawing Kurdish fighters from Turkey may finally find a common object in Iran. 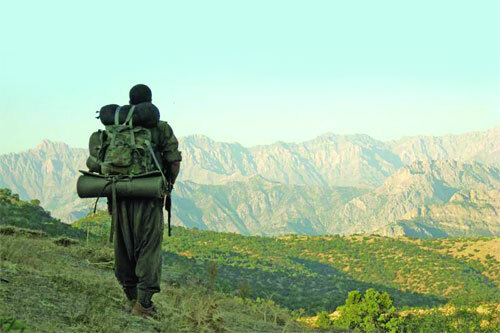 Ongoing truce between PKK’s Iranian arm, Party of Free Life of Kurdistan (PJAK), and the Iranian government may have to face a tricky situation where a unified Kurdish onslaught against Iranian security forces may resurface. It is a stated fact that the Kurds in Syria are the biggest beneficiary of the civil war in the country. Syrian Kurds were long oppressed under the Bathist regime of Bashar al-Assad and his father before him; they remained stateless people without citizenship rights. Kurds in Syria view the civil war as an opportunity to gain more autonomy — like their ethnic kin in neighbouring Iraq. On Nov. 12, 2013, Democratic Union Party (PYD), which has a well-trained militia and is affiliated with the PKK, declared interim administration in the Northeastern region of the country (Rajova) headquartered in Qamishli town. Though, Turkey has condemned the unilateral declaration of autonomy by PYD, and asked for the accommodation of other Syrian Kurdish groups to manage the territory. Although the situation in Syrian Kurdistan seems bit tricky, yet matured Turkey is confident of managing the Syrian Kurds with diplomacy. Ethnic Nationalism in the region was born in 20th century during the last days of Ottoman Empire when Muslims of the region fought wars along with western powers to get the share of receding Ottoman Empire. Later after the formation of modern-day Turkey, Iraq, Iran, and Syria, new authoritarian rulers used majoritarian nationalism to sow abhorrence against co-religious ethnic minorities. Nationalism is nothing but a byproduct of discrimination, oppression, and denial of basic human rights. In the history of the Middle East there never was Kurdish nationalism before the formation of Turkish Republic. Arabs, Turks, Persians, and Kurds lived in the region for centuries and there have been numerous wars and skirmishes which though brutal, were never based on the ethnic identity. Likely integration of scattered Kurdish regions is a momentous development in the Middle East. Kurds of Iraq and Syria are in the process of building a comprehensive strategic alliance with their Turkish brethrens under the aegis of Ankara. There is, however, a little apprehension in predicting the future of Iranian Kurds. Even without alignment of Iranian Kurds, in all probability Kurds can change the dynamics of the Middle East. To achieve any significant goal, it is for the Kurds to get united first under a common and stated vision. Suffice it to say here that Erdogan and his foreign minister Davutoglu’s zero-problem-in-neighborhood-policy freighted by Syrian and Iraqi civil strife may regain momentum with the foreseeable Turkish-Kurdish alliance. Turkey, a regional leader and the world’s 17th largest economy, has a lot to gain with the negotiated settlement of its own Kurdish issue and that may further culminate into the regional Turkish-Kurdish alliance. This alliance, if successful, will facilitate Turkey’s attainment of the much touted regional powerhouse status.